In a State of the Community address to the Saginaw County Chamber of Commerce on Thursday, February 7 Saginaw Mayor Floyd Kloc spoke of the progress the city has made over the past five years as it recovered from the economic downturn. 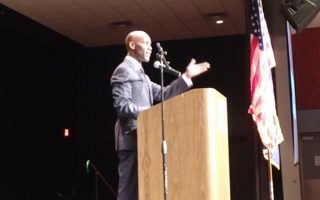 Kloc spoke on several key points, including infrastructure upgrades, education and the workforce, economic development, public safety and the city’s finances. He painted a picture of a city poised to make tremendous growth in the coming years while celebrating the work it has already accomplished. Like the city of Saginaw, Saginaw County is also poised for economic growth and development. Ten years ago, the country was in the worst economic recessions in decades, and Saginaw County was no exception when it came to financial hardship. However, Saginaw County Board of Commissioners Chair Michael Webster says while there are still financial challenges to overcome like unfunded liabilities, the county has seen increased revenues and the tax base has also grown. Projects like the new Saginaw County Jail and economic development in Saginaw, Frankenmuth and other communities ensure the county will continue to attract businesses and people to the area.